Commercialization of citrus fruit juice is always hindered by the bitterness development in juice when stored for a significant period of time. In order to debitter citrus juice, an attempt has been taken up by treating the juice with tannase. Central Composite Design (CCD) based Response Surface Methodology (RSM) has been implemented to evaluate and optimize the effect of underlying process parameters viz., enzyme volume, temperature, incubation time and enzyme titre on debittering effect of Assam lemon juice. The significance of parameters and their interaction were assessed by analysis of variance at 95% level of confidence. 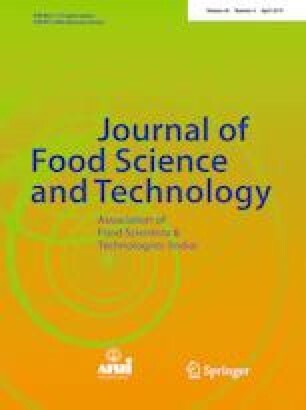 Optimization study reveals that the maximum debittering (40.12 ± 0.02%) of Assam lemon juice takes place at ambient temperature (37 °C) within an incubation time of 2 h and 1.12% (v/v) enzyme volume while 30 IU/ml enzyme activity. Moreover, percentage contribution of the underlying process parameters demonstrate that the enzyme volume and enzyme titre as first and second most significant contributors in process of debittering. As part of validating the above results, experimental debittering has been performed and compared with predicted debittering percentage which showed a high coefficient value (0.971) which ensures the effectiveness of the proposed model. Biochemical analysis of the treated juice reveals improved antioxidant property after enzymatic treatment by 15.30%. Total sugar and reducing sugar content has also been enhanced by 1.38 and 1.49 folds, respectively, after enzymatic treatment of juice. Furthermore, no alteration in the elemental composition of the treated juice ensure that the quality of the final juice is retained with the enzyme applications. Sensory analysis based on nine-point Hedonic scale advocates the best organoleptic property in 1% (v/v) enzyme treated juice. The online version of this article ( https://doi.org/10.1007/s13197-019-03710-z) contains supplementary material, which is available to authorized users.